"nothing heals me like you do"
Noel & I had been talking about and looking at engagement rings for months, so it was definitely something we'd been heading towards. 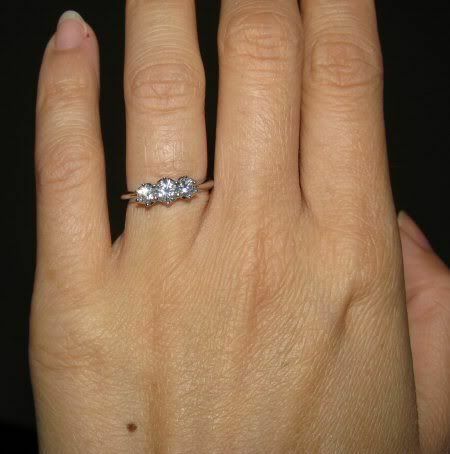 My fingers are tiny, so all the rings we looked at had to be viewed with the question, "can it be resized small enough?" which ruled a lot of designs out. But I really loved this one; it's simple & beautiful & I think it suits me perfectly. He proposed to me in my favourite place in Adelaide - in Borders!!! This seriously is so me, and so perfect really; I always feel most at home when I'm surrounded by books, happy in that blissful kind of way. The fact that Noel knows what that means to me speaks volumes about why he is the perfect person for me to marry. Thankyou all so much for the congratulations & happy messages - you are so lovely ♥ I can't really believe we are actually engaged, but it makes me so happy. You're both so lucky to have each other. I hope you have a successful and happy engagement, followed by a long, passionate, tremendous marriage. Do the kids know? What do they think? Big weddings are totally overrated, IMO. Although mine was lovely John and I both realize now, 10+ years later, that we would have enjoyed ourselves much more if we'd just taken a cruise and gotten married on the beach somewhere. 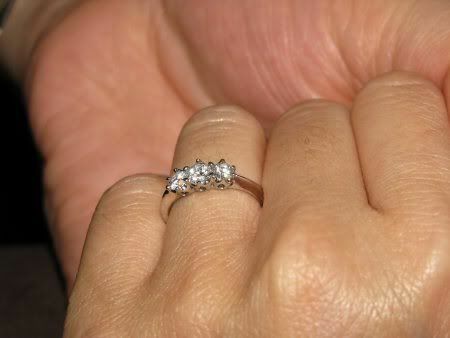 Your ring is beautiful :). So pretty! And I *love* that he proposed in Borders! how exciting! i recently got engaged too. :) and your ring is beautiful, by the way! i <3 simple jewelry. i love that he proposed to you in a bookstore. that's a lovely idea! there is nothing wrong with a long engagement. in fact, i think howie & i may be heading in that direction ourselves. Beyond all I've said and all I've heard in the past, I am so very happy for you and he. The understanding and love that has bloomed between you and Noel actually chokes me up and I'm at work right now! Gorgeous ring! 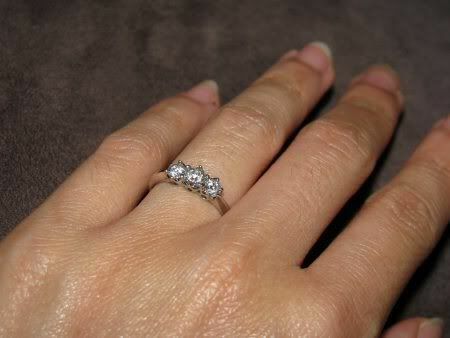 :D And proposing in a bookstore is made of win.